A model of ECM-mediated fibrosis progression. 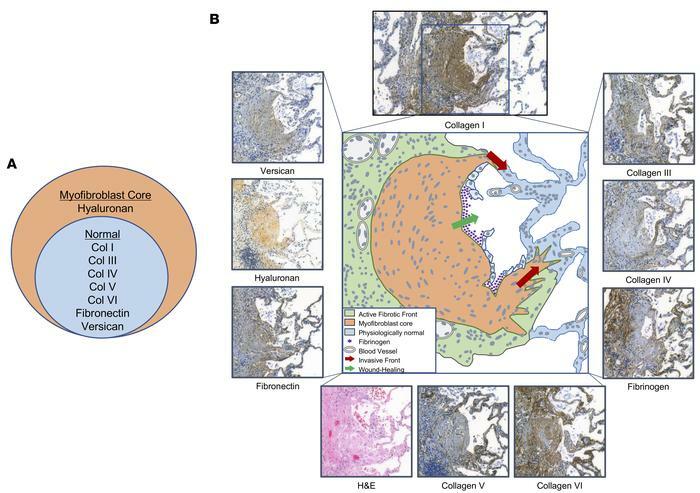 (A) The myofibroblast core of the fibroblastic focus contains collagens I, III, IV, V, and VI; fibronectin; and versican, ECM components also found in the normal lung. In addition, unlike in the normal lung, hyaluronan is ubiquitously present. (B) A fibroblastic focus immunostained with collagen I (top) was traced (center), with nuclei shown as circles/ovals. Surrounding the tracing, immunostaining for each component is shown for the same fibroblastic focus. The fibroblastic focus is comprised of a myofibroblast core and an active fibrotic front, defined as a highly cellular and mitotically active region at the myofibroblast core perimeter that extends into thickened alveolar septa adjacent to morphologically normal regions. This morphology is consistent with a mechanism of fibrosis progression in which myofibroblasts, at thickened alveolar septa, invade into normal regions in response to hyaluronan (red arrows). Fibrinogen marks regions of damaged/stressed epithelium where myofibroblasts begin to encroach into the airspaces, mimicking the situation in wound healing (green arrow).